This morning after David and I had our quiet time we were discussing the passages we read. He asked about a specific verse and I read it from my Bible, New Living Translation. He also was reading this morning from NLT, but his was slightly different than mine. David asked me for the date of the copyright in my Bible because he was thinking it must be a different edition. I flipped to the front to see the copyright date and saw something that I never saw before. The following is what from the front of my Bible. 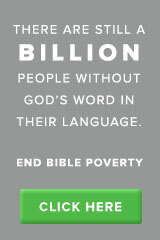 Each sale of the Holy Bible, New Living Translation, benefits Wycliffe Bible Translators, which completed its five hundredth New Testament in 1999 and plans to undertake translation work for every language that needs it by 2025. Tyndale House Publishing and Wycliffe Bible Translators share the vision for an understandable, accurate translation of the Bible for every person. I purchased this Bible at least 8 years ago and did not even know that I was supporting Wycliffe in Bible translation and the Bible had a summary of Vision 2025 this whole time blows my mind. David’s NLT Bible had the same statement. Wow! God is so amazing in every detail! This entry was posted in Wycliffe and tagged Family Life, Last Languages, Wycliffe. Bookmark the permalink. That is so cool! God uses us even before we know He is using us! Thanks for the great Word.